In this excellent, accessible cookbook, Nosrat leads readers through the cooking process. She didn t set out to become a chef, but was so moved by her first meal at Chez Panisse that she wrote Chef Alice Waters a letter asking to bus tables. Amazingly, she got the gig, and she jumped into the deep end of the culinary spectrum, soaking up as much knowledge as she could. In even, measured tones, she explains how salt even the shape of the crystals can affect a dish s overall flavor as well as specific proteins, how fat results in a food s crispness, how heat influences flavor via caramelization, and, perhaps most importantly, how to balance all these elements when composing a dish or a meal. Basic techniques and recipes, such as Vietnamese cucumber salad and pasta al ragu, prove her points. 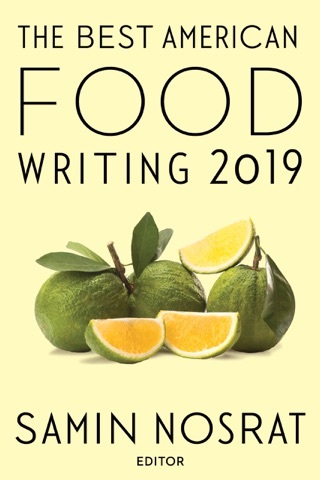 Over the course of the book, readers will learn how to make the perfect Caesar salad, break down a chicken, boil an egg to the desired doneness, and put those skills to use in creating many other dishes. MacNaughton s whimsical illustrations, charts, and graphs add to the experience. This exceptional debut is sure to inspire greater confidence in readers and enable them to create better meals on their own. 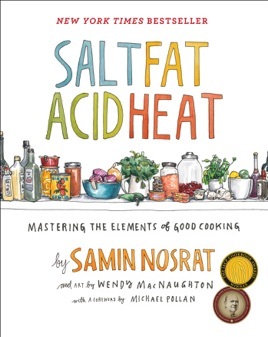 Working from the premise that an understanding of four basic elements - Salt, Fat, Acid, and Heat - provides the foundation of good cooking, Samin Nosrat describes how the four elements combine with each other to create different flavor palettes. If you’re a fan of Harold McGee and/or J. Kenji Lopze-Alt, you’ll enjoy Samin’s book. It might even be difficult to not rush off to the kitchen and explore what you’ve just learned. Wendy MacNaughton’s illustrations add a touch of humor, but also a visual reference (for example, her ‘pesto pie chart’ showing the ingredients of a pesto sauce, from which you can then vary ingredients and flavors). I haven't completely read through the book yet. I like so far the main points of each passage, but, as a scientist, the blatantly incorrect details of the science behind the cooking kind of ruins this book for me. Denaturing a protein doesn't cause proteins to more tightly coil and squeeze out water, it loses all secondary structure and clumps together, leading to shrinkage and water loss. Osmosis isn't the movement of water from less concentrated to more concentrated, it's the opposite. These details kind of ruin Nosrat's authority on the subject for me. I was excited for something akin the "The Food Lab," but it's obvious Nosrat knows very very little of the details actual food science. I think the review that says "just tell me how much frigging salt to use" completely missed the point of this book. Although there are recipes, the book is totally about how these four elements work--separately and together--to make your cooking much better. As you read and learn, you'll know how much salt to use--which kind, when to use it, how much--and how to get desired results based on your tastes, your kitchen, your meat supplier, etc. If you just want to follow recipes, but a different book.